2013 SOTM | NJNA is Blogging! 2013 SOTM (Mostly) Finished Projects! Aren’t they beautiful? Nonetheless, we met as planned for a celebration luncheon. What a delicious feast we had! I can’t believe that I forgot to get a picture of the food — darn! Most of the recipes can be found on the NJNA Website — Members Only tab! We all thoroughly enjoyed getting together to work on this project throughout the year. Our thoughts on Saturday turned to ideas for next year. Unfortunately, we won’t know what the ANG SOTM project for 2014 will be until January, but we do have plenty of other ideas. So we will meet again in January to decide! I hope you are tempted to join us! Rosie’s SOTM for October — Finished!! We had a smaller than normal group for SOTM yesterday and the August stitch surprised us once again! At first, we were not so sure that we liked this month’s stitching — the long, outer stitches on the Sprat’s Head were pulled in and appeared to ruin the stitch spacing. However, we used our needles to adjust and soldiered on! To our amazement, the addition of this new color into the design did some awesome things to the piece as a whole. 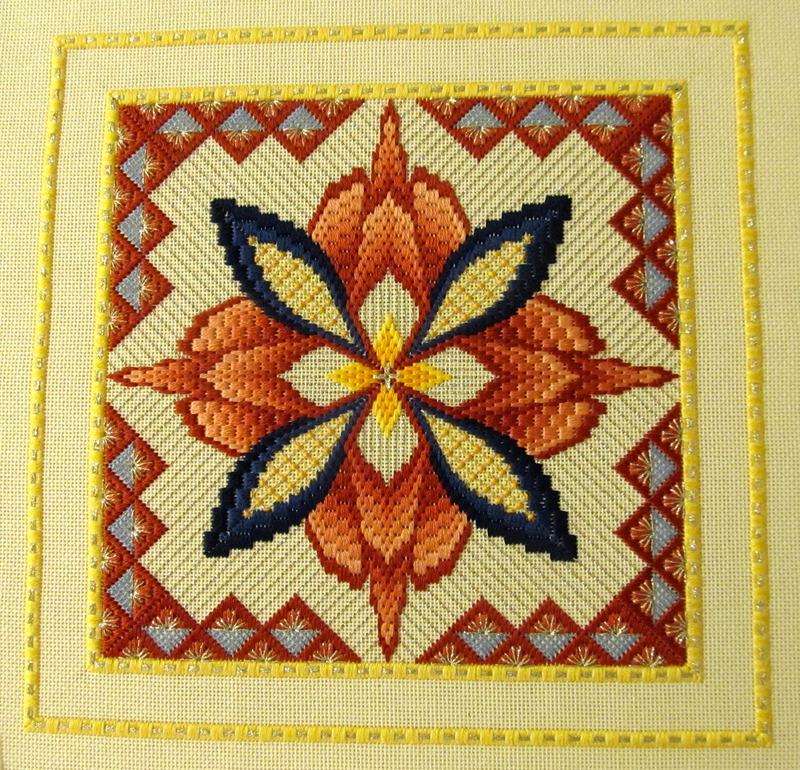 I’m not sure how well this picture shows what I mean because this stitch used only a single strand of floss on congress cloth (no laying!). 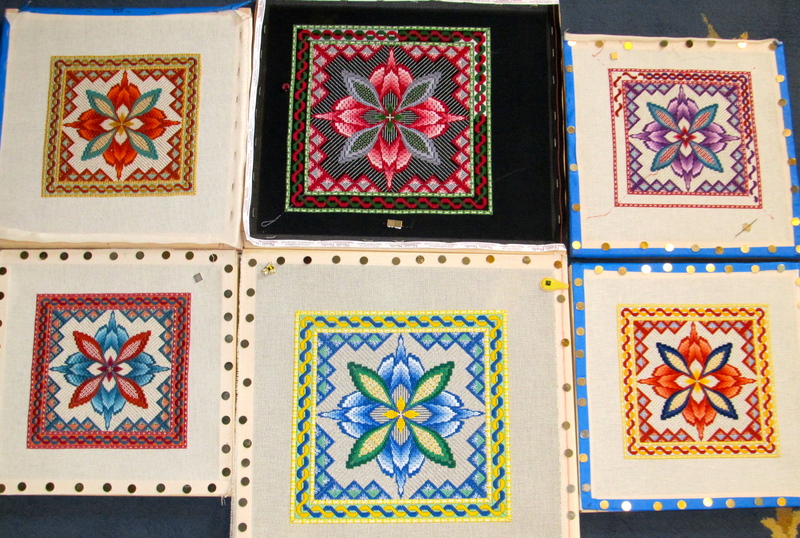 But for my colorway — top right — the medium light blue in the lattice really seemed to balance the colors and to make my yellow pop! I had been disappointed in my accent color (yellow), but now I am thinking that all will turn out well. Sue C and Linda were not able to attend this month, but I am sure that they will have made excellent progress by now and I can’t wait to hear what they thought and experienced! Later today is our annual stitch by the pool and hopefully I’ll get some pictures to post! Hope to see most of you there! Here’s a quick post from the SOTM subgroup of NJNA. 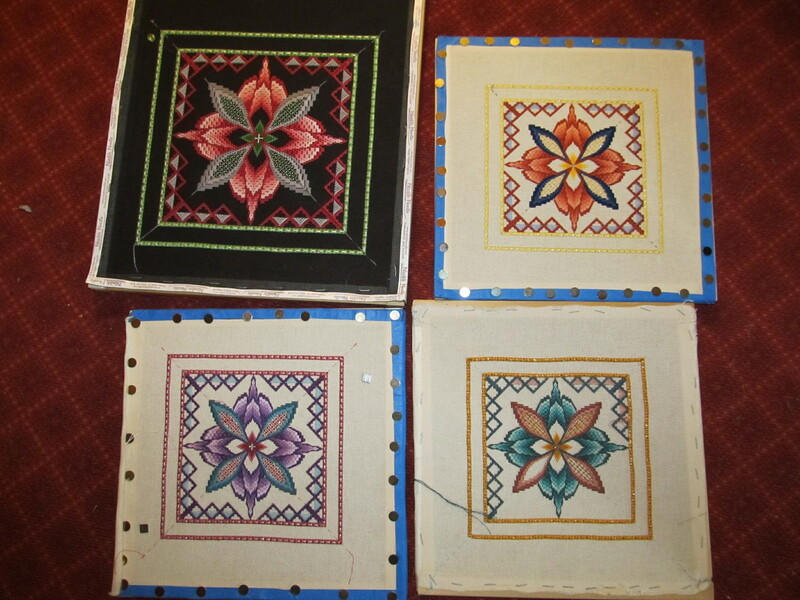 Six of us met at Sue C’s on Saturday to begin stitching the latest installment of this year’s SOTM. Debbie Stiehler always manages to surprise us with each installment. Carol left early, so we took our group picture at 2:00 PM. I think that this was the first month where no one was completely finished at the end of the afternoon — which was another surprise because this seemed like it would be a quick installment! We are enjoying great conversation while oohing and aahing over everyone’s color choices. We had a very small group of stitchers today since Diane was at her son’s wedding (the nerve! ), Carol was off at the horse races, Linda was attending her daughter’s dance recital, and Sue R is back in Atlanta (she did promise to send a picture of her progress)! So Sue C, Gwen, and I downloaded the June installment this morning and what a surprise! 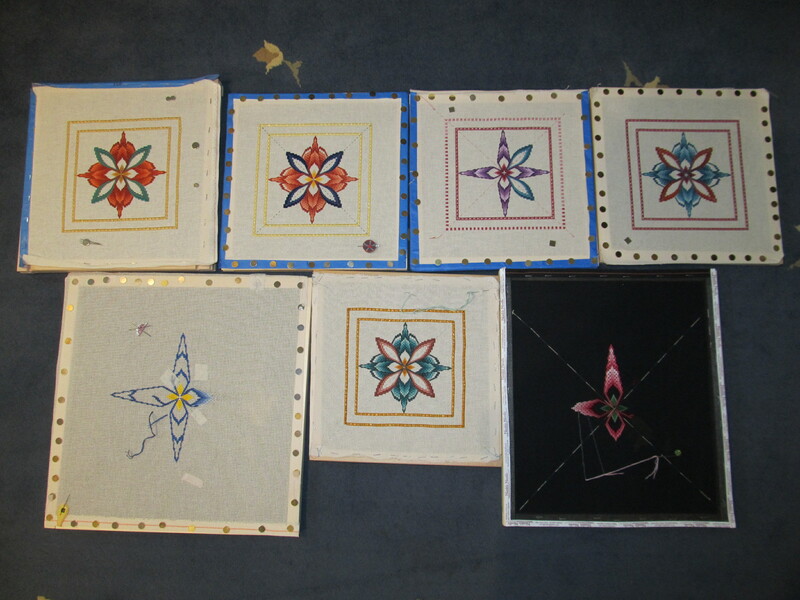 Instead of bargello, we did a very interesting open canvas pattern in the interior of the “leaf”. Color choice matters! The new stitching shows up beautifully on Sue C’s canvas (left). We are looking forward to seeing the rest of the SOTM canvasses at the meeting! 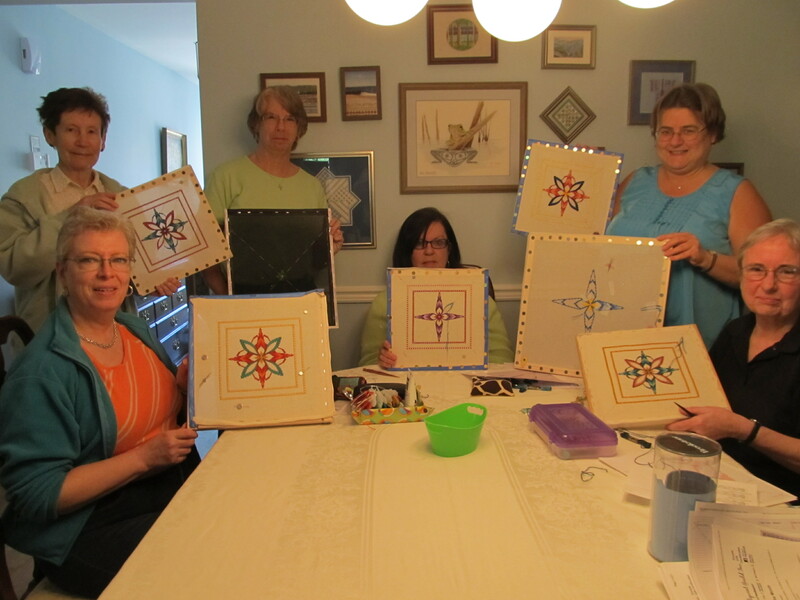 Seven of us gathered today at Sue C’s home to continue our stitching adventure with the May SOTM stitch. 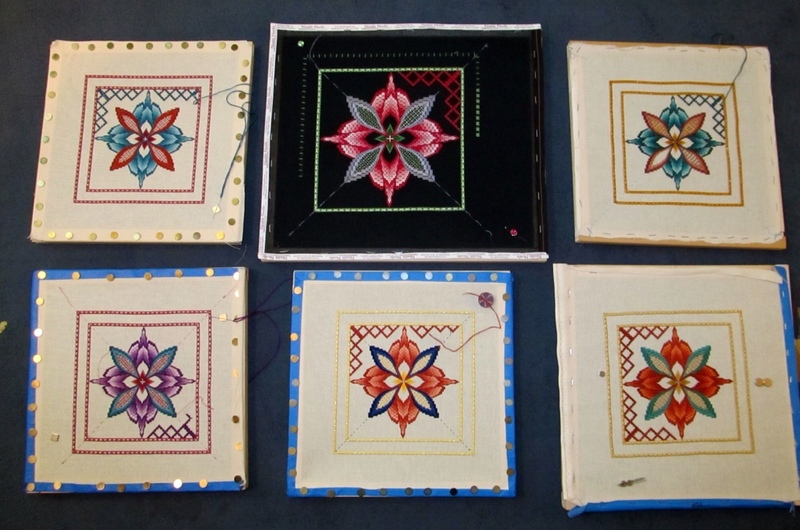 Stitching today were Rosie, Sue C, Gwen, Linda, Carol, Sue R and Diane. We all had been speculating as to what this month’s stitch would entail – would we work in the border, fill in some of those blank areas inside previous stitches, or perhaps something else? I think most of us were convinced that we would definitely be using some of the colors not yet opened. We all agreed that the areas to be stitched were not what we expected and that the emerging design is certainly starting to bloom! 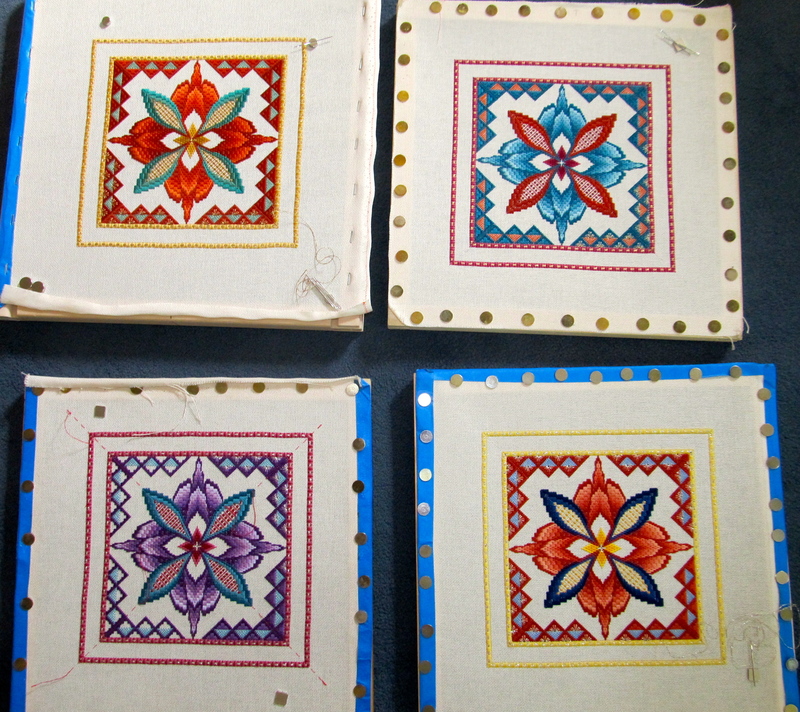 Although we are at different stages in the stitching, the differences in the color choices are readily apparent. Here we are just before breaking for lunch (and thanks to Sue R for taking the photo so that we could get Rosie in the picture). After lunch and delicious brownies baked by Sue C, we spent the remainder of the afternoon continuing with our stitching as well as lots of good conversation. We are unanimous in how much fun this design is turning out to be and the experience of stitching it as a group is priceless. Here we are at the end of the day. Great progress is being made and each of the pieces is so unique. Just look at how dramatic Diane’s piece on black canvas is turning out! We are already anticipating the June installment.